Articles The Barefoot Horse ~ No hoof, no horse! The Barefoot Horse ~ No hoof, no horse! Keeping a barefoot horse is becoming more popular every year. As a farrier of 30+ years, I have had the opportunity to experience many theories on how to manage the horse’s hoof to insure soundness. After all these years there are more points of view than ever on how to achieve and maintain our goal of soundness. “Shoeing is a necessary evil” is a quote from my horseshoeing textbook. For many years, nailing on a metal horseshoe on the bottom of the hoof has been the undisputed modality for protecting the hoof – despite the recognized adverse effects. These adverse effects include, but are not limited to: prohibiting the natural expansion of the hoof capsule during weight bearing, increased concussion to the hoof and leg, separation of the hoof laminae by the nail, lack of frog support, and contracted heels (although the issue of contracted heels may be more an effect of an improper trim than the actual application of a horseshoe). Applying metal shoes to the bottom of horses feet has continued because there have been no good alternatives to protecting the horse’s hoof. Until now. Currently there is a growing trend toward a more natural approach to equine hoof care. Many horse owners are choosing to have their horses go shoeless. While there are advantages for the barefoot horse, there may be times when protection is needed. That protection is now available in the form of slip-on rubber or plastic composite boots. While the application and removal of these boots has become relatively easy, it is my experience that the choice to keep a horse barefoot and use boots for protection when needed requires a bigger commitment from the horse owner than keeping a horse shod. The hooves of a barefoot horse must be trimmed at more regular intervals than a shod horse. Horses will do best if maintained on ground similar to what they will be ridden on (in other words you cannot expect a horse maintained in a wet pasture to move comfortably over rocky, hard ground). Boots must be properly fitted. The rider needs to frequently check the boots for rubbing at the hairline and bulbs of heel. Take time to introduce and condition your horse to the use of the boots (it is not be prudent to take your horse out on a difficult ride or compete on the day you decide to change tack). There is more information and great products available now for the horse owner than ever before, but above all, remember to listen to the horse. They will tell you what works for them and what doesn’t. 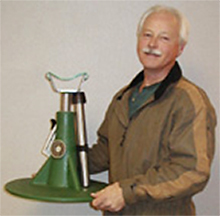 Equine Innovations Inc., was founded in 2000 by president/owner Kevin Keeler as a means to promote his invention the Hoofjack. Developed out of a desire to make his career as a professional farrier easier and safer, Kevin invented a unique hoof support system which he named Hoofjack. You can visit hoofjack.com for more information.